Gardner Pilot Academy third-graders Sophia Deoliveira (left) and Mariaeliza Vasquez and Vasquez's parents look for the girls' artwork on display at the Harvard Ed Portal. 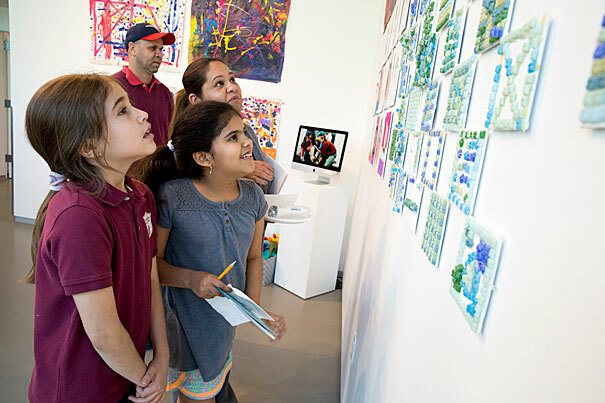 It may have been hanging a bit over their heads, but that didn’t stop Gardner Pilot Academy students from noticing their colorful art prominently featured at the Harvard Ed Portal’s Crossings Gallery in Allston. The excitement of seeing their creativity on display was palpable during the opening reception for “Magnificent Mosaics and Spectacular Self-Portraits: Works by GPA Third Graders” on June 7. 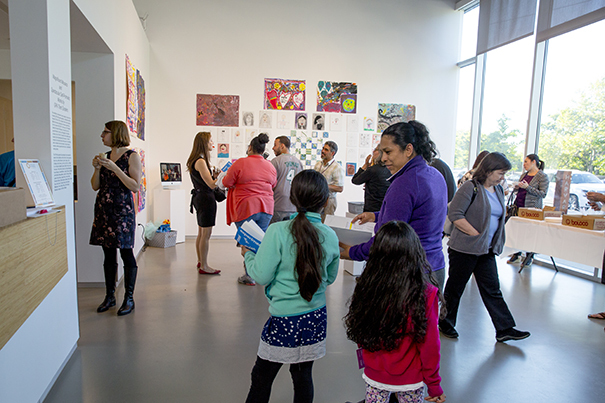 More than three-dozen young artists and their families attended the event celebrating the students’ self-portraits, mosaic tiles, and abstract paintings. The exhibition capped an educational initiative that began last fall, when a team of faculty and staff from Gardner Pilot Academy, the Harvard Art Museums, and the Ed Portal united to create an experiential learning program for third-graders. “An overarching goal of our collaboration is to help students harness their passion for learning, creativity, and curiosity,” said David Odo, director of student programs and research curator of University collections initiatives at the Harvard Art Museums. The project tapped Harvard resources to strengthen the art curriculum and expand knowledge and appreciation of artwork among students at the Allston K-8 school. Elizabeth Byron, an art teacher at Gardner Pilot Academy, said the program provided students a detailed understanding of the creative process. Students visited the Harvard Art Museums in December and May, exploring works and artists, history, and materials behind each piece. When the students returned to the Ed Portal, they created their own art inspired by what they viewed at the museum. After the first visit, the third-graders focused on self-portraits and mosaics. After the second, they worked together to create murals in an abstract style, using colors to represent their feelings. Gardner student Jenayah Rose could not wait to come home after each project to tell her mother how much she loved going to the museum and then creating art of her own. A self-portrait by student Libby Cartagena featured a rainbow above her head. Positive reflection for students was one goal for Alysha English, who received her master’s degree from the Arts in Education program at the Harvard Graduate School of Education in May. As a Public School Partnerships intern leading the project at the Ed Portal, English coordinated planning and support for students and teachers, conducted in-school learning sessions and pre- and post-museum discussions, and led a professional development seminar on helping teachers access Harvard Art Museums resources online. Brighton resident Elizabeth Egan had come to the Ed Portal for a different event, but spent time exploring the Gardner exhibition. Erica Herman, principal at Gardner Pilot Academy, said the project helped students develop an appreciation of art in daily life.